Jesse Barfield is considered to have had the best outfield arm of the 1980s. He finished in the top 10 in MVP voting twice, was an All-Star, Silver Slugger and 2-time Gold Glove award winner. He led American League outfielders in assists for three consecutive years (1985–87) and starred in what many analysts considered the best all-around outfield of the 1980s with the Toronto Blue Jays. 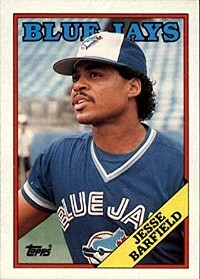 Selected by the Blue Jays in the ninth round of the 1977 amateur draft, Barfield debuted in the majors in 1981. He was a regular the following season and hit the first pinch hit grand slam in franchise history. With 18 home runs and 58 RBI, he finished eighth in AL Rookie of the Year voting, solidifying himself as a regular in the lineup for years to come. In 1985, Jesse batted .289. He hit for both power and speed, with 27 homers and 22 stolen bases. Further, as a defensive standout, he recorded 22 outfield assists and became the first Blue Jays player to hit 20 homers and steal 20 bases in the same season. That production lead Toronto to the playoffs for the first time in franchise history. Jesse Barfield’s best season came in 1986. He reached career-highs in batting average at .289, 40 home runs, 108 RBI, 107 runs, 170 hits and 35 doubles. The 40 home runs led the major leagues and set a team record. In addition, Barfield was awarded the Gold Glove, Silver Slugger and was selected to the American League All-Star team. In 1989, Jesse was traded to the New York Yankees for Al Leiter after 9 seasons with the Blue Jays. He played 4 seasons with the Yankees through the 1992 season. In 1993, Jesse went to Japan and played with the Yomiuri Giants. In 1994 he joined the Houston Astros for spring training and was projected to be the opening-day right-fielder, before being sidelined by injuries. Barfield was a career .256 hitter in 1,428 games. He hit 241 home runs, 216 doubles, 30 triples, 716 RBI and scored 715 runs. Jesse had 6 seasons with at least 20 home runs and 20 doubles over his 12 year Major League career. His eldest son, Josh, is a former infielder with the San Diego Padres and Cleveland Indians. His son, Jeremy, has spent ten years in the minors with the Oakland A’s, Colorado Rockies and is currently with the Boston Red Sox. Sponsors for the event are Driscoll Foods, Amsterdam Print, The Recorder, CSEA, and River Ridge Living Center.